Independent Expert on Albinism Ikponwosa Ero. Ms. Ero described the situation as “an emergency, a crisis disturbing in its proportions.” According to the police, 65 cases have been recorded since late 2014, and at least two further critical incidents reportedly occurred during her visit. “Given the relatively small population size of people with albinism in Malawi – reported to be a little less than 10,000 – attacks against a few of them constitutes a danger to all of them,” she stressed. “It is clear that an urgent and coordinated response from the Government, civil society and development partners working in strong partnership with each other is required,” she noted while stressing the principle of ‘nothing about us without us’, which includes the involvement of organizations of persons with albinism at every step, where the process cannot be led directly by them. “The early return of suspects to their communities – whether due to the use of bail, fines or low judicial sentences – increases the fear in which persons with albinism live, sends a message of impunity to affected communities and increases the risks of mob killings,” she added. Ms. Ero pointed out that, although the amendment of relevant legislation is required, more immediate measures are also necessary such as a judicial direction that cases be handled only by professional magistrates and through the ongoing revision of the Sentencing Guidelines. She also commended the protection measures adopted by community police and some traditional authorities as well as the support provided by communities to their members with albinism. “The quick intervention of neighbours during attacks has in various cases led to the rescue of persons with albinism and to the arrest of perpetrators,” she said. “Addressing the root causes of attacks, in particular why they are happening, is indispensable to eradicating them. It is worrying to note that witchcraft beliefs and practices are widespread in Malawi, although often a taboo topic,” Ms. Ero stated. The Independent Expert will produce a full report and recommendations to be presented to the UN Human Rights Council in March 2017. 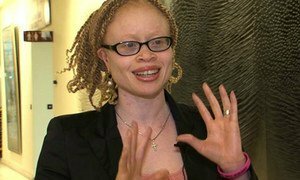 People with albinism are being hunted for witchcraft rituals, their body parts hacked off with machetes, and even having their graves desecrated, a United Nations expert warned today in her first report to the UN Human Rights Council.